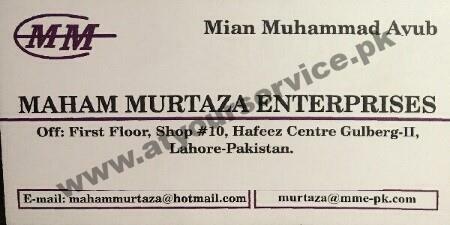 Maham Murtaza Enterprises is located in Hafeez Centre, Main Boulevard Gulberg III, Lahore. It provides quality products of computer world. It imports different kind of Computer/Laptop related products of various popular brands from various countries and to provide to local dealers & customers at very reasonable price with trust and faith in less time.